I don’t care, I don’t care, I don’t care! I don’t care if Illinois’ license plates say they’re the Land of Lincoln. They’re not. Indiana is the one true Land of Lincoln. I say this as a lifelong Hoosier who clings to every piece of Indiana tradition and historical significance I can. Memorial at Abraham Lincoln’s boyhood home in Spencer County, Indiana. And if that doesn’t say we’re the Land of Lincoln, I don’t know what does! 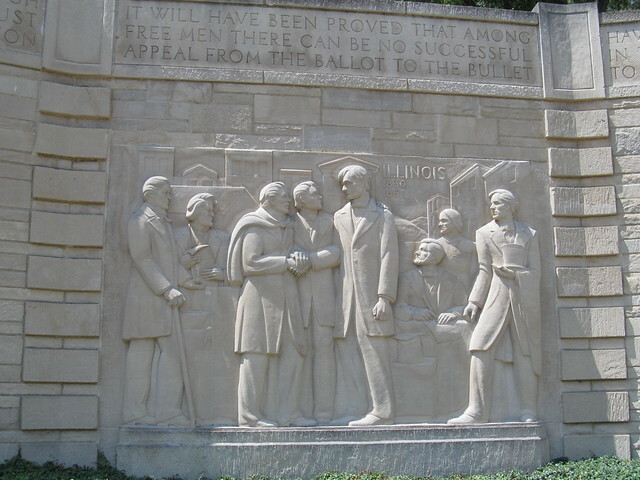 Which means that if anyone gets to lay claim to being an influential part of Abraham Lincoln’s life, it’s Indiana. His family moved here in 1816, to Spencer County (what was then part of Perry County), before leaving for Illinois in 1830. So we had him during his formative years, from when he was 7 until he was 21. What that all means, to me, at least, is that Abraham Lincoln should be — and is — celebrated for being a Hoosier, even if it was only for 14 years. And someone is doing just that. Indiana Landmarks is sponsoring the Lincoln Highway Adventure and Traveling Feast on Saturday, July 20, following the 1928 route of the Lincoln Highway, from the Ohio State Lane, stopping for meals along the way, and ending with dessert in Plymouth, Indiana. The caravan will meet at the Besancon Catholic Church in New Haven, Indiana, you’ll get lunch in Fort Wayne, dinner in Winona Lake (Kosciusko County, a twin city to Warsaw), and dessert in Plymouth. Tickets are $35 for members of the Indiana Landmarks, and $45 for non-members. If you’d rather, you can get a Carload ticket, which includes breakfast and dessert (lunch and dinner are on your own), for $15 for members, $25 for nonmembers. For more information, and to register, visit the Indiana Landmarks website.